A large Israeli military force invaded, earlier Saturday, many homes in Kobar Palestinian village, near the central West Bank city of Ramallah, and illegally confiscated cash from homes. 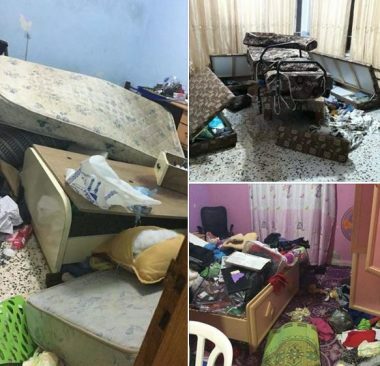 Media sources in Kobar said the soldiers stormed and ransacked several homes in the village, and interrogated many Palestinians. They added that the solders illegally confiscated 1850 Shekels from the home of Na’el al-Fahel, 2400 Shekels from the homes of Sarhan Barghouthi, and another sum of cash from the home of Mohammad Mashal. Medical sources said the soldiers also shot five young Palestinian men, during protests against the ongoing invasions. The entire village has been isolated and subject to ongoing invasions and searches of homes , and other types of collective punishment, since the death of Yotam Ovadia, 31, who was stabbed, on Thursday at night, in Adam nearby illegal colony. Israeli sources said Mohammad Tareq dar Yousef, 17, from Kobar, allegedly managed to climb over the fence into the settlement of “Adam,” and stabbed three people before he was shot and killed. In related news, the soldiers invaded Abu Shkheidim, Abu Qash and al-Mazra’a al-Qibliya villages, and Birzeit town, and fired live rounds, rubber-coated steel bullets and gas bombs at locals, protesting the invasions. In occupied Jerusalem, the soldiers abducted Ahmad Rokon, from his home in Ras al-Amoud neighborhood, in Silwan town, and took him to an interrogation facility.